ForeverNigella#24- Easter With Nigella Old Fashioned Chocolate Cake. 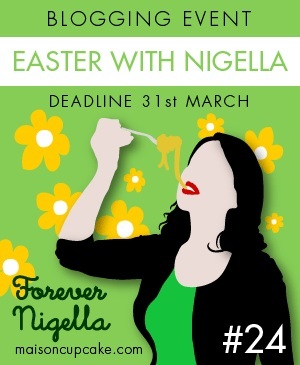 I’m now on my third go at joining with #ForeverNigella. This is a monthly blog hop where bloggers link up and share their favourite bakes and recipes. It is organised by Sarah of Maison Cupcake which is a fab blog for all things foodie. I love reading Sarah’s blogposts whenever I get the chance. This month’s #ForeverNigella is organised by the lovely Jen of Blue Kitchen Bakes which is another brilliant blog to catch up on baking and book reviews. I’m looking forward to linking up with the other bloggers taking part so I can see what everyone else bakes at Easter. This month’s #ForeverNigella is called “Easter With Nigella” and I just had to share one of my favourite ever Nigella recipes which I have baked not only for Easter but at other times of the year as well. This recipe is none other than the Old-Fashioned Chocolate Cake from my well thumbed, coffee spattered and messy copy of “Feast”. I bought the Feast book back in 2004 not long after my son had started school. He was the younger one of my two children and at the time I was a stay at home mum. I had been a primary school teacher before my children had been born and although I did some supply teaching before the birth of my son in 2000, I had been out of the workforce for a while. It was to be another two years before I would return to work, albeit as a teaching assistant. My confidence was at rockbottom and I had no self esteem. Baking was complete therapy to me as I felt here was something I could be good at. It took away the depression and loneliness I felt from being at home all day. Nigella’s Feast book is described on the book jacket as ” a feast for the eyes and for the senses”. I could totally relate to that. I was in Borders bookshop in York one day and I stood there absorbed in the book, looking at all the recipes. I knew as I wasn’t working my own money was tight but I didn’t care! I HAD to have the book so I shot off to the cash desk to pay before I could change my mind and regret it. Nearly 9 years later it’s been one of my most used recipe books so I’m glad I bought it! Anyway, enough of the waffle and here is the recipe that makes me think of Easter and this time of year. The “Old Fashioned Chocolate Cake” is not classed as an Easter recipe in the book, it comes under a special chapter entitled “Chocolate Cake Hall Of Fame” and this is the first recipe in the chapter on page 269. The cake itself contains cocoa powder but the flavour that makes it old fashioned and not too overpoweringly sweet is the presence of sour cream. The recipe is a simple all in one method that can be put together in a mixer or food processor which was very encouraging for me in my early days of baking. It is baked in two 8″ sandwich tins (sorry metric amounts just confuse me) for about 30 minutes. The chocolate icing is made with real chocolate, more sour cream, butter and icing sugar as well as vanilla extract as well as more sour cream. I always try to use the best quality chocolate I can find. It spreads perfectly well on top of the cake and it just tastes sublime. Here are just two of the versions of this cake I baked last year at Easter, although it has also been turned into a summery chocolate cake with handmade sugar roses, a Christmas chocolate cake with sugarpaste trees and as a birthday cake with hearts on. These are the Easter versions as shown below. 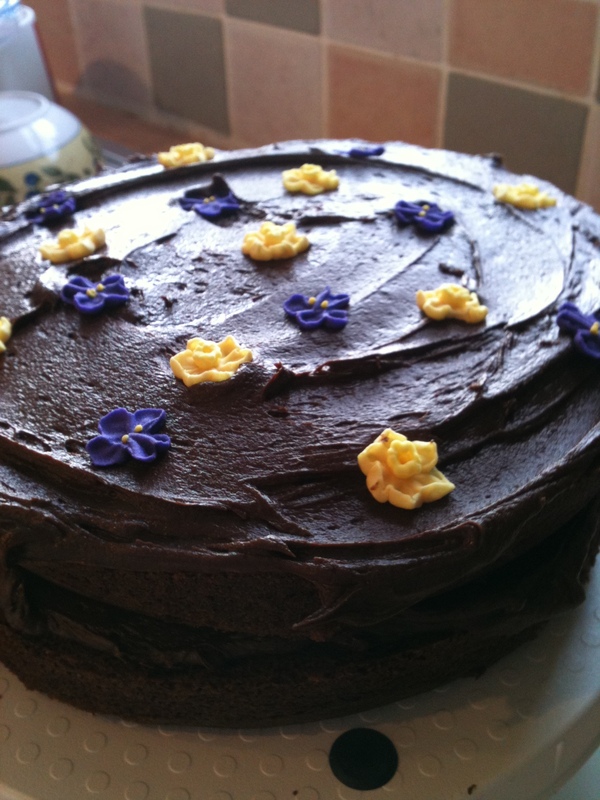 This version of the Old Fashioned Chocolate Cake has ready made Spring daffodils and violet sugar flowers on top of it. Another version of the Old Fashioned Chocolate Cake, this time I’ve added Cadbury’s Chocolate Flakes and Mini Eggs to look like an Easter nest on top of the cake. 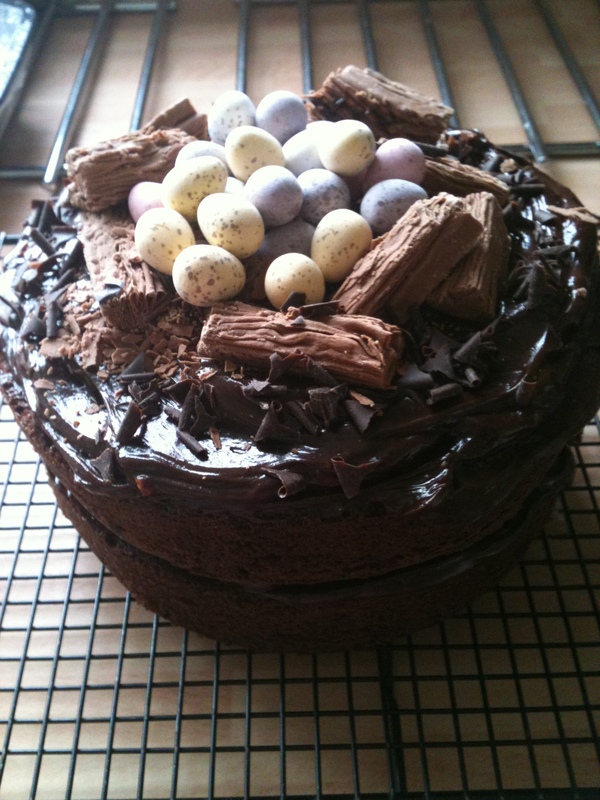 I am looking forward to making this cake again at Easter this year. I’m not sure how I will decorate it, depends what the kids fancy on top of it but all I know is that it won’t last long in our house! Next Post St Patrick’s Day Cookies and Cakes. I love the one with the nest! I would have to go to a specialty shop for the Flake, but we get the little eggs at Easter at every grocery store. So cute! Feast is definitely my favourite Nigella book. I’ve baked this cake too and love it. I love your Easter decorations.